Back in the year 1989, you would have seen a group of young women surrounded by tables working an assembly line in one of the houses in the village of Sa’ir, north of Hebron. There was a table for cutting slices of lemons, a table for squeezing its juice, a table for straining it, and a table for packaging the sliced, squeezed and strained lemons into bottles. At first glance, this simple process looked like a communal project that was suggested by a neighbor over a cup of coffee on a sunny morning. In fact, it was a production line that played a role, modest though it was, in building a resistance economy. This was the Sa’ir cooperative project, which was formed in the first Intifada at the initiative of the Union of Palestinian Women’s Committees. It was inspired by 25 young women from the union and their friends who were politically, economically and socially active in the struggle. It was one of the cooperatives that spread throughout the occupied territories during the Intifada, as a productive mechanism that reflected a strategy of economic resistance that aimed to strengthen resilience and self-sufficiency. Cooperatives were one of many tools of economic resistance. The developments of the Intifada forced changes in Palestinian consumption and production patterns, as consumption of the enemy’s goods was no longer an option due to the boycott. The economic blockade and the cessation of Palestinian laborers from working within the Green Line resulted in a decline in the incomes of Palestinian families, necessitating the creation of productive areas that provided both work and food for the purpose of enhancing sustainability. To a certain extent, the cooperatives developed the phenomenon of domestic economics, helping to meet basic needs beyond those of a single family. At the beginning of the Intifada, the home-grown initiatives, with the help of the Unified National Leadership of the Uprising (UNLU), supported the proliferation of home gardens planted with vegetables that families needed. Additionally, poultry and livestock were tended to, and the promotion of small-scale food and industrial projects such as textiles was encouraged. The productive adaptation of nascent cooperatives led to the creation of a new kind of cooperative, unlike service cooperatives in the fields of transportation and marketing, or productive cooperatives geared towards generating profits for its shareholders. This adaptation came as a response to the limits imposed on domestic production, especially with regards to its operative inefficiencies and lack of diversity. Dozens of cooperatives of this type were formed in the West Bank and Gaza Strip during the Intifada, and each one had between five and twenty members. Most of them were characterized by a primitive inner structure. They did not go beyond cooperatives in domestic production, such as those that produced pickles in neighborhoods, although it was not uncommon to see cooperatives organizing agricultural labor and livestock rearing as well. 1. Samara, Adel. “Ada’ al-Mu’assasa al-Iqtisadiya fi al-Manatiq al-Muhtalla Qabl al-Intifada wa Khilaluha [The performance of economic institutions in the occupied territories before and during the Intifada].” Majallat al-Dirasat al-Fialstiniyya, 1.1, 1990, pp. 30-31. Shalalda says, describing the ethos of the cooperative. In her oral testimony, Ms. Lamya Shalalda recalls her experience in the Sa’ir cooperative, narrating the intersection of national struggle, production, and feminism. With modest funding, the Union of Palestinian Women’s Committees organized these ideas in women’s cooperatives. The village women assisted in providing raw materials for the manufacture of whatever was needed in the village. These experiments combined popular experience in food processing on the one hand, and the scientific basis for forming sustainable products with a longer shelf-life on the other. “This was a true fusion of modernity and originality,” says Shalalda. The process began with renting a place that was fitted with simple tools, from barrels to utensils to hand juicers. The main factor was manual labor. The provision of sugar was very important as well, in addition to gas cookers, which were bought from the area. The Union of Women’s Committees provided the raw materials for the cooperative, since women were not financially capable of purchasing these materials. The work was disorganized at first, so the women had to coordinate with the Union, which was paying them per working hours and marketing their products. According to Shalalda, this activity was multi-dimensional, as “there was a sense that this cooperative was part of the Palestinian national struggle”. This was reinforced by the village’s embrace of cooperatives so that the cooperatives’ headquarters became a selling point for the village and the whole area. Yet the missing link, as relayed by Shalalda, was the extent to which women working in the cooperatives were involved in decision-making. It was the supervisory authority that exercised the role of planning on behalf of the working women, who were the most active people in the cooperative. 1. A group of researchers. 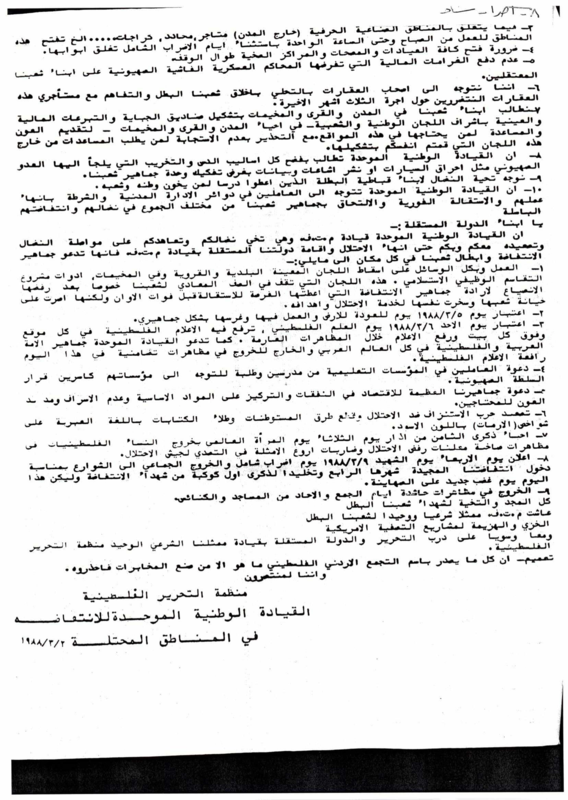 Al-Intifada Mubadara Sha’biyya: Dirasa li Adwar al-Qiwa al-Ijtima’iyya [The Intifada as a Popular Initiative: A study of the role of social forces], 1990, pp. 182-187. 2. Shannar, Hazem. “Al-Awda’ al-Iqtisadiyya wa al-Ijtimayiaa’ fi Dhil al-Intifada [Economic and Social Conditions In Light of the Uprising].” Majallat al-Dirasat al-Fialstiniyya, 1.2, 1990, p. 40. Adel Samara describes this as “taking a self-defensive stand.” Increasing politicization took people in the direction of volunteerism, which in turn promoted a culture of thrift and the acceptance of local products that were of a lesser quality. Carried forward by the momentum of national struggle, Palestinians turned to boycotting Israeli products, even if at a slow and partial rate. While individual and collective efforts gave the initial push to these experiments in economic resistance, the UNLU eventually started playing an active role in charting their course. They also played the role of encouraging and perpetuating these models as a national goal, and not merely as a means of securing daily needs. 1. Samara, Adel. Iqtisad al-Daffah wal Qita’ min Ihtijaz at-Tatuwwor ila al-Himaya ash-Sha’biya [The economy of the West Bank and the Gaza Strip: from holding development to popular protection]. Akka: Dar Al-Aswar, 1988. On February 18 1988, Communiqué 8 called for a comprehensive boycott, a return to the land, and the promotion of a domestic economy. Communique 9 added to it the need to work productive sectors to their maximum capacity, and to regulate working hours for skilled professions. Finally, Communique 10 then called for detailing products that were to be boycotted immediately, and demanded a control of the market for fear of manipulation. Later communiques gradually called for active labor boycotts, demanding the immediate cessation of Palestinian work in Jewish-only settlements, and the reabsorption of these labor forces in the Palestinian economic sectors. They also called on agricultural engineers to train and educate the masses, and supported the building of cooperatives and reorienting consumption patterns, all of which further strengthened community organization and social solidarity. Under Communique 21, the leadership forbade promoting Israeli products and sanctioned those who did. It also called for withdrawing savings accounts from Israeli banks and improving workers’ conditions by counting strike days as working days. Furthermore, a committee to protect economic and agricultural institutions was formed. This was followed by Communique 22, which forbade in no uncertain terms the payment of fines and bonds, also calling for the boycott of Israeli tourist institutions. The experiment of replacing Israeli products with local ones contributed to the notion of self-development. Local initiatives provided Palestinians with a minimum level of self-sufficiency. This strategy of survival and steadfastness (sumud) was touted as a means of achieving economic independence, itself a precursor to achieving political independence. One of the paradoxes of the first Intifada was that the mornings that did not begin with the sound of metal shop fronts opening were sometimes the busiest days of productivity. These acts of “stoppage” represented the strongest and most effective tool of struggle. Civil disobedience was not born in the Intifada. For decades, strikes represented a spontaneous manifestation of mourning for martyrs, before becoming a form of popular resistance, or becoming a way for the UNLU to announce its political positions through its communiques. Strikes continued to grow ever since 1967, becoming a truly confrontational weapon in the early 1990s. The occupation authorities were kept busy forcefully opening stores during strikes, and closing them during the operating hours upon which the resistance had decided. Strikes took place on several fronts during the Intifada, varying in terms of size, territory and areas of business, including workers, transportation and educational institutions. The strikes went hand in hand with calls for self-sufficiency, boycott, and civil disobedience, such as the rejection of Israeli orders, handing over identity cards to soldiers, and the refusal to pay taxes. The individual and collective initiatives had a decisive significance in pitting economic resistance against Israeli laws and procedures. The role of the UNLU here was instrumental. On January 10 1988, Communique 2 directed workers to boycott work during strike days, also calling on shopkeepers to comply with the strike. Slogan revolving around “an end to land confiscation” and “an end to taxation” quickly became a rallying cry of social revolt. Communique 3 came out in the same month, saluting shopkeepers and urging them to continue forming committees in every city, neighborhood and street. It implored them to formulate collective national positions refusing to pay additional taxes, while calling on workers to continue boycotting Israeli employers. 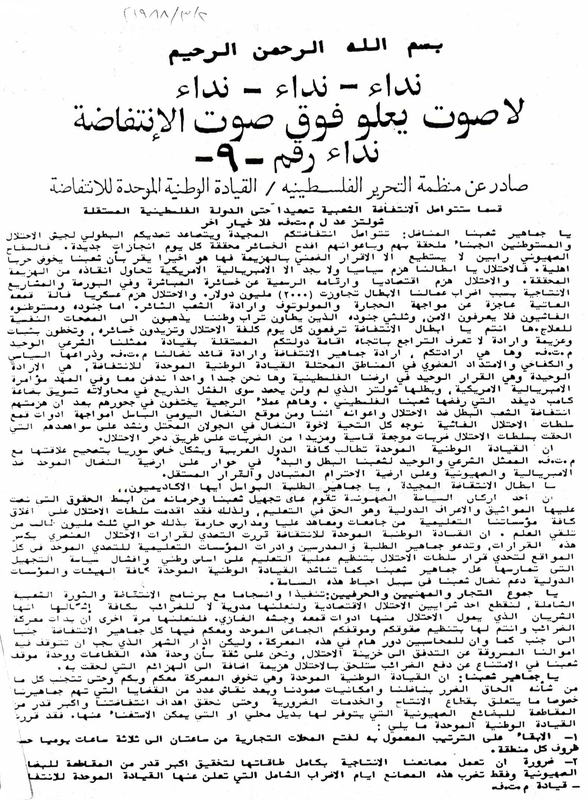 On February 2 1988, Communique 6 advocated for the continuation of the previous directives. It called for refraining to pay fines, reducing the burden on tenants by delaying rental dates, boycotting Israeli goods, and encouraging the national economy. Urban businessmen and small shop-owners played a decisive role in encouraging the commercial strike, as well as in supporting acts of tax evasion and the boycott of the Israeli Civil Administration. In coordination with the UNLU, merchant participation set the day-to-day pace of disobedience, defying the Israeli attempt to impose its own version of “normality” upon daily life. 1. Tamari, Salim. “Makhatir al-Rataba: al-‘Isyan al-Mahdud wa al-Mujtama’ al-Madani [Risks of Monotony: Limited Rebellion and Civil Society].” Majallat al-Dirasat al-Fialstiniyya, 3, 1990, p. 6. The experience of the town of Beit Sahur encapsulates the model of the economic Intifada advocated by Palestinians. In addition to working on achieving productive and agricultural self-sufficiency, the town’s residents all committed to refusing to pay taxes in February 1988. This led the occupation army to resort to punitive measures by doubling fines and bills on families. The families reacted to this crackdown in unexpected ways. They refused to pay taxes, declaring a state of total civil disobedience. They gathered over one thousand identity cards and handed them over to the Israeli military officer of the area. The campaign for the refusal to pay taxes continued for over a year, and the occupation authorities tried once again in September 1989 to impose further taxation in an attempt to break the civil disobedience. “Since 19 September 1989, Beit Sahur has been besieged by hundreds of Israeli forces. A new military barracks was built near the shepherds’ fields for the execution of military orders. The Israeli order for the residents to pay taxes turned into a big military operation, which targeted the economy of the town and involved the “break the bones” policy, the arrest of children, and the pillaging of shops and factories. The Israeli authorities were unable to force any resident to negotiate with them, or even to pay meager sums in return for their confiscated properties. The military operation moved from the stores to the homes. In some cases the army seized the entire contents of a household, piled them in a truck and took them to the auction place. Phone lines were disconnected, media were refused entry, and throughout 42 days, hundreds of residents were arrested and used as hostages in exchange for paying taxes. One of the residents involved in tax evasion efforts, Ilyas Rishmawi, said that the agricultural committee busied itself with planting vegetables in every plot of land around every house. Rabbits and chickens were raised to ensure the supply of meat in the case of a military curfew. “Soldiers would get hysterical when they smelled grilled meat in the town of Beit Sahur during the siege and curfew,” Rishmawi said. The military operation imposing the payment of taxes began in September 1989. The entire town of Beit Sahur was under siege. All entrances to the town were closed, phone lines were cut off, and food and medical supplies were forbidden. The popular and work committees, in coordination with the committees in the surrounding areas, announced a state of emergency, working night and day to combat the effects of the closure. “In one of the houses, after the soldiers were about to leave, they heard a woman screaming at them to wait,” said Rishmawi. 1. Qumsiyeh, Mazin. Popular Resistance in Palestine: A History of Hope and Empowerment. London; New York, Pluto Press, 2011, p. 211.